Unlike the Catholic church where saints are created at breakfast, lunch and supper, the Orthodox church doesn’t mess up its throngs with just anyone. I mean, if John Paul II had his way, the whole population of Poland would be beatified (with General Jaruzelski the patron saint of dictators). No, the Orthodox church even used to distinguish between saints: there was Aghios (someone who must be have been martyred for his faith) and Osios (someone, usually a monk, who was simply very pious). Sadly, nowadays, even that distinction is fading away. Ah, the slippery slope – shaving the beards will be next. So it was with great excitement that I visited the small chapel of Osia (or is it Aghía? no one is sure) Methodía on Kimolos, a 20th century saint, only beatified by the Patriarchate in June 1991. 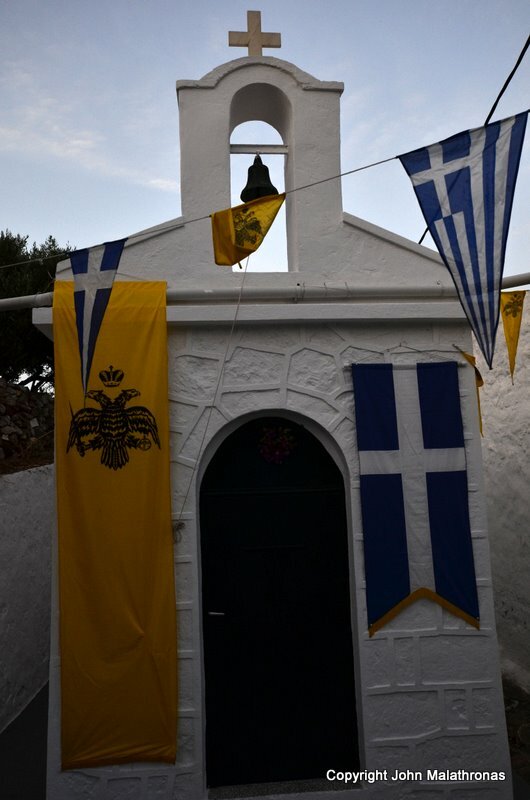 It is because of her that the small, pristine island of Kimolos with its intact Aegean flora and fauna, gets its fair share of religious tourism. 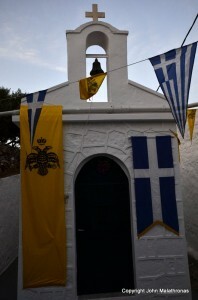 St Methodia was born on 10 November 1861 on Kimolos, the third of eight children. The number of offspring of a family still survives in some areas of the island. The beach of Deka denotes a family with ten children. There is one of Nine, one of Eight and, remarkably, one of Thirty. Anyway, back to Methodía. She was baptized Irene and was married off to a sailor from Chios, who soon after died at sea. Irene became a nun, took the name Methodía and, as there was no nunnery on the island, she slept alone inside a makeshift cell in the inner Kastro of Kimolos next to the 16th century Church of the Nativity. During Lent, she shut herself in completely, but at other times, she preached and performed the usual miracles using annointed oil. She died on 5 October 1908, which is to-date her memorial day, and she has been venerated ever since by the Kimolites. On 15 August 1946, they petitioned the Patriarchate for beatification and jumped the gun by naming her the patron saint of the island. They built a chapel on the site of her cell and transferred her relics to the capital’s Cathedral of the Virgin on 5 October 1991 during the official beatification ceremonies . Her image is conspicuous in the houses of the island and, if you check, on the Kimolos ferry to and from Pollónia on Milos. I don’t know what you make out of all that, but I am still thinking of the Beach of Thirty. Frankly, I think any woman who survived so many pregnancies on Kimolos in the years past should have been sanctified, but, well, that’s me. PS. Oh, and the chapel was locked.